In pop culture, happy, healthy marriages don't exist. Apart from the "chick lit/flick" arena, most movies, TV shows, novels, videogames, you name it, ignore husbands and wives entirely unless A) they're in the process of falling back in or out of love, or B) they're in some supportive role - usually the worried parents of a younger, more dynamic protagonist. This is especially true in sci-fi and fantasy; the only couple I can think of who started their story happily married and stayed that way are Hermes and LaBarbara from Futurama. All too often, happily married couples in these stories meet a decidedly unhappy fate: Take, for example, Star Wars' Uncle Owen and Aunt Beru, Shadow and Laura in American Gods or Firefly's Zoe and Wash.
Maybe it's subliminal schadenfreude - authors and audiences alike acting out their personal miseries on fictional whipping boys. But I think the real reason is far more innocuous: Our society assumes that happy marriages are simply too boring to deserve any attention. Marriage, it's implied, is a state that, if left uninterrupted, will continue on peacefully forever. Only with a little misery can things become interesting. If that were true, the divorce rate would be much lower, as the sort of dramatic and epic violence that occurs in sci-fi and fantasy stories rarely mirrors real life. 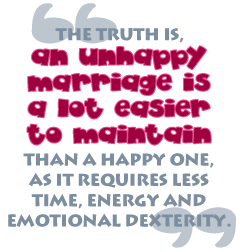 The truth is, an unhappy marriage is a lot easier to maintain than a happy one, as it requires less time, energy and emotional dexterity. Falling in love is easy. Staying in love is hard. And although the story usually ends as the heroes kiss and ride off into the sunset, that's really just the prologue, after which the real work can begin. Last autumn, I married my college sweetheart in a sunset ceremony at a nearby art gallery. It was a small, quiet affair with less than 35 guests, no receiving line or fussy chuppah and a wedding pie instead of cake. (The cake, after all, is a lie.) And yes, I did end up walking down the aisle to "Aria di Mezzo Caraterre" as I had so long ago planned. A few months before the ceremony, I sat down for coffee with my grandfather, now married 54 years, in order to pick his brain about the ingredients for a successful marriage. I was nervous - terrified about the ceremony, but even more so about what came after. I knew my grandfather, who'd never lacked for advice on any subject in his entire life, would be able to supply me with just the right foolproof, 10-step recipe for marital bliss. When I asked him how he and Grandmom had managed to stay married for so long, he squinted thoughtfully and took a lingering sip from his cup. "I'm not sure," he said after a long while. "Sometimes I really can't stand her." I stared at him, mouth slightly ajar. "She really can be a pain in the patushka," he said slowly. "And she was never what I typically considered beautiful. My type was more the tall, thin girls, the ones with small breasts."